My name is Gene and I’m a 52 year old male. About 5 years ago I began to slowly lose control over my bladder due to a small bladder tumor. After having the tumor removed I found myself incontinent. Being incontinent and trying to return to school or work seemed impossible for me at first. After my surgery I wasn’t able to return to my old job. Managing my problem at home was hard enough, but at work or school — no way!! There seemed to be little info available out there about practical day to day management. So I thought that this letter might help those out there that also find themselves at this point. Returning to work is a big step for those of us who are urinary incontinent! It didn’t take long for me to understand that thin, lightweight diapers wouldn’t last long enough for times away from home. I had bought several brands of adult diapers from the medical supply store and found that none had kept my heavy voiding (wetting) under control. After I had told my sister about it she asked a friend of hers that had spina bifida if she knew of a better adult diaper and that’s the first time that I got a useful tip. Karla had recommended a medical supply company that was on the web that sold quality made re-usable diapers with waterproof plastic pants. It took awhile, about 4-days, to get some to try-out, and I highly recommend to always get only a sample pack when possible as they are very costly. They seemed to work quite well, but are also very bulky. I purchased about 8 of their 4-ply diapers with 4 pants that go over the diapers. Now at least I could resume my job quest without fear of leakage problems. My sister then asked how I felt about working at a nursing home?? I had not thought about that, and I was wondering about the fact that I might also have to reveal my disability to my employer which I did not want to do. In fact, besides my family, only Karla, (my sister friend) knew about my bladder problems. After I had been to several nursing homes, and had filled out their applications I got a call from one locally and I went in for the interview. I was very nervous. I did put down on the application that I had a disability but I also wrote that I would discuss it at an interview. When the interviewer got to that section she did ask and so I had to tell her that I was incontinent, and I could work a full-time shift if needed as long as I could change diapers at work. She seemed very polite, and comfortable asking me about my incontinence needs and then said it was no problem at all. I got a call that afternoon that I was hired!! Since then I’ve attended the CNA classes and I’m happy to be here. I now make it a point to find out about other adult incontinence products from those who use them rather than a TV commercial. 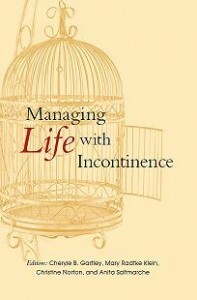 I found that my incontinence wasn’t my disability — it was the fear, and embarrassment I got from unsuitable protection!! The book Ms. Gartley wrote really helped me. The first of its kind!!! Posted in Shared Stories from People with Incontinence and tagged Cheryl Gartley, managing life with incontinence, urinary incontinence.